I have never felt this guilty about giving a film a subpar rating. Not only because it’s a film starring a paralyzed actor doing his best, but because it was one of that actors last roles. Apart from a few guest spots, this made-for-TV movie that premiered on ABC on November 22nd, 1998 was one of the last times any of us had the pleasure of watching Christopher “Superman” Reeve. Though what would pleasure be without pain? We all know the plot to Rear Window, right? If you haven’t seen it then it’s the same plot to Disturbia. Though instead of a broken leg/ankle bracelet, in this version, it’s a man who becomes a quadriplegic after a severe car crash. 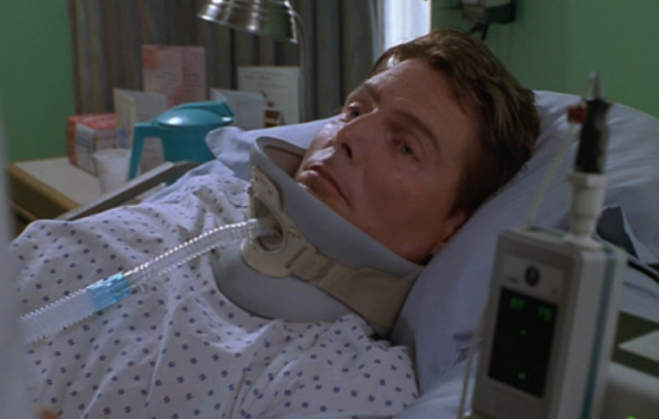 Honestly, Reeve’s struggles with his actual paralysis on camera are far more interesting than the familiar thriller plot that follows. 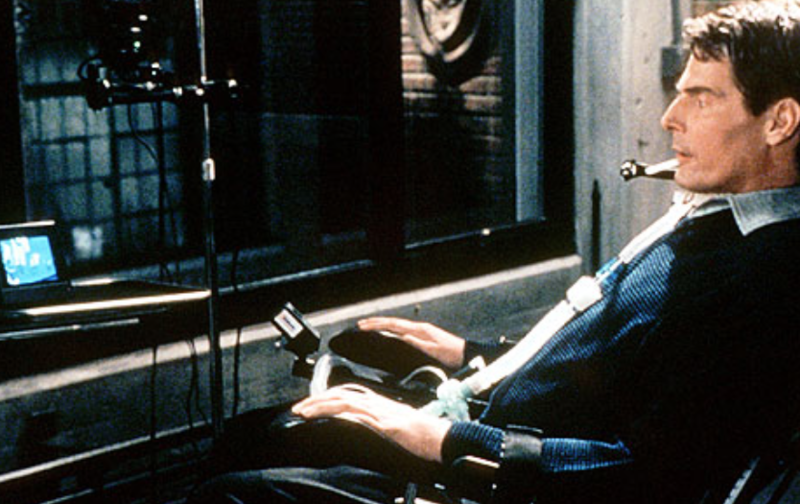 The first 15 minutes or so are solely dedicated to Reeve’s rehabilitation. 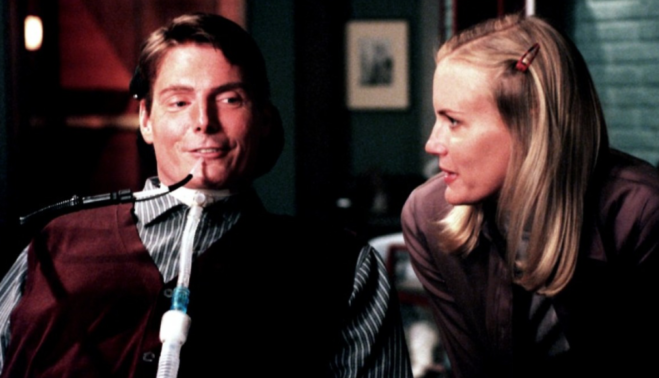 It’s actually quite fascinating to see Reeve’s character Jason, a former architect, learning to breathe with a tube and regain his motor functions. There’s a scene when his breathing tube comes out and a nurse must struggle to reconnect it before he suffocates. That scene is scarier than anything else in the entire film. Sadly, the film goes downhill once Jason is moved to his new refurbished apartment complete with an assistant, Claudia (Daryl Hannah), and voice-activated electronics. The smart house is a neat idea but its seems useless considering Jason also has an assistant. I would have much rather seen Jason, brooding alone in his futuristic home, slowly becoming obsessed by what he sees out the window. And what does Jason see? An abusive relationship between a sculptor and his girlfriend. This is the point where the movie couldn’t feel more made-for-TV. The “scares” or “thrills” or “spills” or whatever you want to call them are lame. The overly orchestrated music tries to set you up for suspense but it just feels like a so-so episode of Murder She Wrote. The bad guy is nowhere near as intimidating as Raymond Burr was in Hitchcock’s original classic. Robert Forster has a nice turn as a doubtful detective that provides for some entertaining conversations, but few other characters have any spark. Daryl Hannah’s Claudia is too dumb to be useful or interesting and Jason’s Jamaican day-nurse Antonio (Ruben Santiago-Hudson) feels like a tired stereotype. The film desperately lacks any good ideas outside of Jason’s physical struggles. On a high note, Reeve did receive a Golden Globe nomination for his performance. I wouldn’t even say it feels like a pity nomination either, it’s a good performance. Reeve is funny and genuine. How could he not be? He was actually paralyzed!